A “Darker, Edgier” Green Lantern in 2014? Despite the fact that critic and audiences aren’t clamoring for a sequel, Warner Bros are pressing forward with a second Green Lantern. 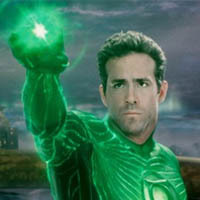 I like the Green Lantern character but didn’t check out the movie because the marketing was all over the place. However, I can’t stand the “make it dark” note films get these days, mostly to try and get a piece of the action that The Dark Knight got. Studios don’t seem to realize that audiences responded to that movie because it was good, not because the tone struck their fancy. Another interesting piece of info is Warner Bros’ inclination to ditch director Martin Campbell for a fresh start, but Campbell’s contract gives him first dibs on the sequel. If that’s the case, the studio will have to pay a bit of change before even settling on a new director. That’s not a particularly great note to start out on. Kristen Stewart To Join The “Akira” Remake? Comments for A “Darker, Edgier” Green Lantern in 2014? are now closed. Movie Vine / Comics / A “Darker, Edgier” Green Lantern in 2014?